After the groundbreaking first album "Tragedy" a small year earlier, Julia Holter released her second one "Ekstasis" on RVNG Intl. in 2012, re-issued by Domino in 2013. Both full lengths have been recorded during the same period span of three years after the playful and minimalist (sonically close to Dominique A's "La Fossette") CD-R "Eating The Stars", but if "Tragedy" was loosely based on a concept (Euripides' Hippolytus), "Ekstasis" doesn't follows much else than the definition of its title, the ancient Greek word for ecstasy, which means to be or stand outside oneself. This second opus contains a collection of ten more personal songs, which covers different subjects and moods, while remaining once again rather consistent. And indeed, ekstasis there is, to a certain extend, throughout almost the entirety of this thing, and surely while listening to some of the most compelling songs in Julia Holter's as well as in anyone else's catalogue. This album benefits also from the addition of ex-Ariel Pink’s Haunted Graffiti guitarist Cole M. Greif-Neill who mixed the whole thing and gave a brighter and cleaner sound to it than its predecessor. Julia's voice is way more prominent and we can really enjoy the extend of its beauty, even through different echoes and always tasty electronic effects. Furthermore, Julia Holter chose for more immediate song structures and quite conventional singing but if her compositions get closer to a pop format, with memorable melodies and even some further extended reoccurring rhythm patterns, at times reminding more adventurous chillwave stuff, they stay far from being called pop songs, i.e. intuitive experimentations, unorthodox instrumentation and unexpected developments still prevail and keep them thrilling (thrillwave?). The three most thrilling songs on "Ekstasis", and the ones that are bringing me to some kind of ecstasy, are without a doubt "Marienbad", "Boy In The Moon" and "This Is Ekstasis". The opening track, "Marienbad", was inspired by Alain Resnais' movie and masterpiece "L'année dernière à Marienbad" (1961) and Julia seems to question the nature of being a statue compared to being human and vice versa. This is maybe one of the most elaborate Holter's compositions, composing and decomposing it all along, touching on Renaissance madrigals. Julia is multi-tracking her voice to give it an almost boy's choir aspect while accompanied by a lovely Fender Rhodes sorta rondo, which is alternately replaced by stomping synth bass line followed by colossal sampled drums and tympani's, more gentle metallic percussion and some piercing background synth and barely recognizable guitar in its middle. The voices progressively transform into some pretty melodic Meredith Monk-ian multiple vocals pattern, it gives the tune an orchestral, playful and a surprisingly pleasant if a little creepy feeling of being in some fantasy world where them statues in that park (one of them is standing behind Julia on the album cover) would be dancing a farandole together. The fourth track, the eight-minute "Boy In The Moon", is of course a totally different affair, even though it shares with most of the songs of this album a similar multi-layered, orchestral, circumvoluted and ever-evolving course. "Boy In The Moon" archs slightly back to Julia's previous album and its sometimes dilated post-psychedelic trip - she worked with Linda Perhacs after all. The first half of the song is dominated by interwoven guitar sounding synths with some viola hanging high above, which gives the impression of floating in the belly of an ocean. Julia's slightly echoed and rather upfront throaty voice adds a dreamy impression. She also sings very slowly, articulating each syllables into long lunar notes. At this point, the music reminds me of a meeting between Supersilent's softer moments on their absolutely gorgeous opus "6" (2003) and Tangerine Dream circa "Phaedra" (1974), I find the latter reference quite potent for the entire length of this track. Its middle presents a most enthralling musical shift with unexpected low electronic waves appearing out of nowhere while the rest of the instrumentation has reached its sharpest, highest and tensest moment, it gives both an overwhelming and uplifting effect like being suddenly transported, if not teleported, into another space and time continuum. The ending slightly replicates the beginning of the track with way less emphasis on the guitar sounding synths, more on dense electronic drones, synthesizers, Julia's long hums, the belly of the ocean has been replaced by the galactic void. Klaus Schultze would be glad to call this thing his own for this is 'kosmisch muzik" of the highest order. The closing track, the almost nine-minute "This Is Ekstasis", is a strange mix bag of bluesy late night balladry and medieval folk with piano, electric bass, huge sounding drum-machine, synthetic strings and gong, giving a slightly oriental feeling, for the first third of this song with Julia slightly sounding like Laurie Anderson. For a little while, the song turns into some light free jazz improv with saxophone, minimal piano accompaniment and Julia's breathing. It quickly and shortly changes again into a quite barebone neo-medieval ambiance à la Dead Can Dance, with upfront cello, something like flat bells and near Lisa Gerrard's vocals when suddenly the echoed voice of Julia Holter enters the scene and introduces surreal uptempo drums, and yet another Julia appears again, without echo, with "a surreal 'la la' motif worthy of French film soundtracks of the Sixties" (Piero Scaruffi). The song ends with some freely improvised alto saxophone with a repetitive and haunting cello melody accompaniment. Most of Julia Holter's longest compositions are built like suites with three to a dozen (like "Celebration" on "Tragedy") different intertwined movements or parts, and despite some of those parts being diametrically different to the previous or the next one, the whole remains unified. Best of all, it just works. We are led from here to there through anywhere and if it doesn't always makes sense, there's ultimately a holistic feeling. It defies logic. Something like a miracle. Or Julia Holter is just plain brilliant. The other songs on "Ekstasis", if they are less ambitious in scope, sure possess their share of surprises and inventiveness. The harmonium and massive bell-like synth introduction to "Our Sorrows" recalls Nico until a marching beat and Julia's bright voice enter the scene, we are for a short moment close to Broadcast area, if they would have played in a church (besides, Julia's voice may summon the late Trish Keenan at times), interspersed with some background chattering found sounds (the unique such occurrence on the album). An unexpected shift and the song becomes a celestial Indian vocal improvisation worthy of Sheila Chandra surrounded by tasteful synth waves. "In The Same Room" flirts with plastic 80s synth-pop, so with contemporary chillwave polymer bedroom pop including chinese vocals here, girlish Stina Nordenstam's intonation there, which ends up in some kinda amateurish but charming ambient something. The contrast with the richness of the next "Boy In The Moon" is striking. Enya coupled with Klaus Nomi seem to appear on "Für Felix", a slow-paced baroque thing filled up with a harpsichord/sitar-hybrid prominent decor, it all dives into darkness in its middle with some successful imitation of a low played bowed guitar. It finishes with a short music box interlude before some increasingly noisy distorted organ, then it abruptly stops. The shortest song yet in Julia Holter's repertoire is "Moni Mon Amie", a charming little ballad ditty full of twinkling keys, orchestral bass line synth and drum-machine, with some beautiful words girlishly sung by Julia, a.o. "I look at you and I would rather look at you than all the portraits in the world" quoted from one Frank O'Hara poem. The shadow of Laurie Anderson reappears all over the place, musically and vocally, on "Four Gardens", which amalgamates oriental world music, electronic beats and free jazz with the addition of clarinet and bass clarinet. This last song is maybe one of my least favourites of the bunch. Two songs were left on the side till now, or better said, two versions of the same song, "Goddess Eyes II" and "Goddess Eyes I". If the first one, called "II", is rather interesting, being a complete re-recording of the same song "Goddess Eyes" already on the previous Holter's "Tragedy", it brings some fascinating sound structures and new vocal melody lines, still recalling Enya on that account, the second one, called "I", doesn't offer anything more than a brighter and crispier production. Besides, if I can understand Julia Holter wanted to make a wink at her previous album, both having been created at the same time, they are like siblings somehow, why on earth put both on the same album? I must say that I got slightly irritated when I heard that already repetitive vocoder once again. What was the point? Did Julia wanted this song to be her own "O Superman" so much that she felt the need to rehash it again and again? Or do I miss something? I listened numerous time to this album without those two songs and it sounded much better that way. This is my only real reserve concerning this otherwise excellent album. With "Ekstasis", Julia Holter is getting dangerously close to that huge wave of bedroom pop whatever chillwave movement which popped up in the late 2000s, but she definitely distinguishes herself from all of it thanks to her gigantic compositional talent, her endless imagination, her impressive vocal accomplishments, this with a quite ordinary yet pretty voice to start with, and her tremendous attention to details coupled with genuine flair and intuition. 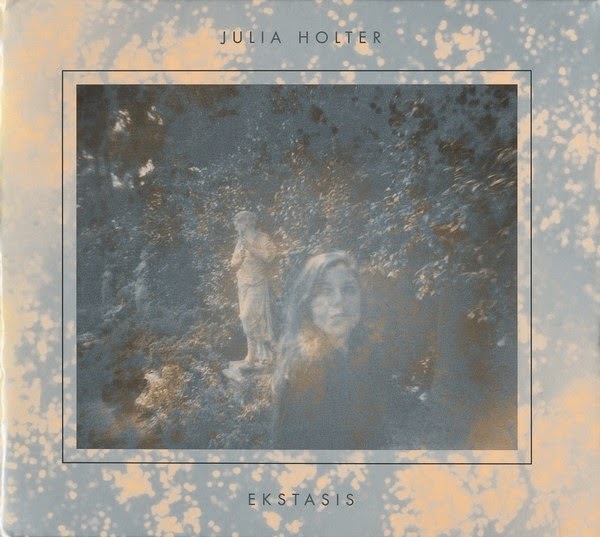 Besides, it is all the more impressive knowing that "Ekstasis", as well as "Tragedy", were near completely recorded and produced home by Julia Holter herself. While "Tragedy" talks to the head, "Ekstasis" speaks obviously more to the belly.